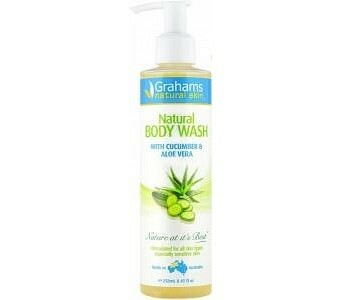 Grahams body wash contains a Lipid Layer enhancer which helps restore lost oils in the skin and helps to moisturize while you cleanse.With Cucumber & Aloe Vera this body wash, specially formulated for those who suffer from Eczema, Psoriasis and sensitive skin, provides a fresh scent and invigorating cleanse. Excellent for the whole family! Ingredients: Water, Sodium Lauroyl Sarcosinate (naturally derived), Cocamidopropyl Betaine (plant derived), Sodium Lauroamphoacetate, Caprylic/Capric Triglyceride, Glycerin (vegetable derived), Manuka Honey, Coconut Oil, Xanthan Gum, Orange Peel Extract, Orange flower extract, Lavender extract, Citric Acid, Sclerotium Gum, Phenoxyethanol, Natural coconut fragrance.